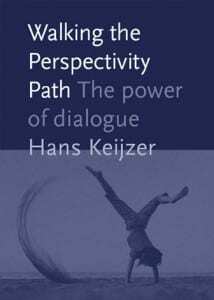 On Saturday the 19th of September, Hans Keijzer’s book: Walking the Perspectivity Path, was officially launched. The Tolhuistuin in Amsterdam was filled with close to 70 family members, friends and other people interested in Hans or his book to experience this heartfelt event. It was a beautiful day with emotional, inspiring and practical moments. For a question to be really open, you have to let go of all the influence over the answer. Grandma, if I must do something, I don’t want to do it, but if I’m allowed to do something, I do want to do it. The more we dive into it, the more we can draw only once conclusion: that our universe is one inseparable organism. What is Perspectivity? It takes a whole book … and then .. you will only have my perspective of what Perspectivity is. It is our belief that … you should start at home. Let us know which part you found most inspiring, tweet #perspectivitypath or use facebook @perspectivity. Walking the Perspectivity Path is a book that appeals to the heart and the mind. In its pages, Hans Keijzer tells a highly personal story about his quest for an attitude that is focused on the service of society as a whole. He reveals himself as a passionate thinker who appeals to our own ability to create connectedness, even in situations where this might be difficult and will require courage. Hans was convinced that both the ability and the courage to create connectedness are essential for the development of viable solutions to many problems in today’s complex world. The Perspectivity Network is the outcome of his unstinting efforts to make a concrete contribution to that goal. Trained as a mechanical engineer, Hans Keijzer spent most of his career at DSM. In his ultimate position as Director of DSM’s Corporate Risk Office he supported the company’s high growth and performance targets by ensuring that consistent and up-to-date Risk Management procedures were in place at all relevant levels of the organisation. Sadly, Hans is no longer with us now, he died in 2013. His legacy lives on through the work of the Perspectivity Network. For this reason, this book uses the Pay It Forward method. Pay It Forward is s a way to inspire a movement of people that show acts of generosity to others to become more aware of the essence of social cohesion in our society. “Pay It Forward” means the recipient of a favor does a favor to another, or several, rather than paying the favor back. In this case: We have shared the book within the Perspectivity Network. We trust that those who have read the book will be encouraged and inspired to Pay It Forward and start a ripple effect of inspiration. We like to know! You could, for example, buy a copy of the book and give it to someone else whom you believe will benefit from reading it. You could decide to make a donation to the Perspectivity Foundation for the value that you attach to the book. Even better, you could surprise us with your act of generosity to build a social ripple of inspiration. Order your book via managementboek.nl or on bol.com and Pay It Forward!